The beginning of the legend started with one man! But who held the first patent? The classic styling of the Adirondack Chair becomes the legend! Classic style meets modern twists with creative and unusual twists on the design. The Adirondack Chair becomes a worldwide celebrity! 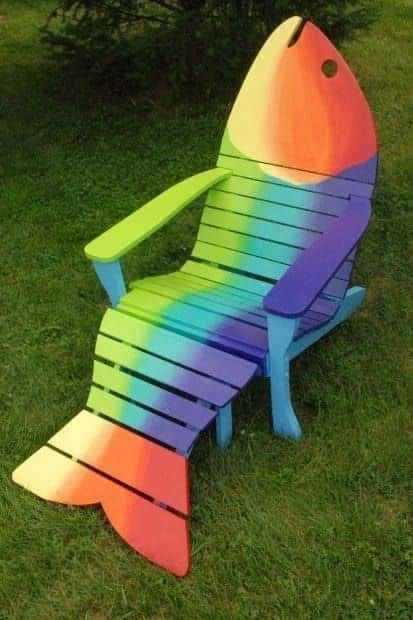 5 - Something's Fishy with this Adirondack Chair! 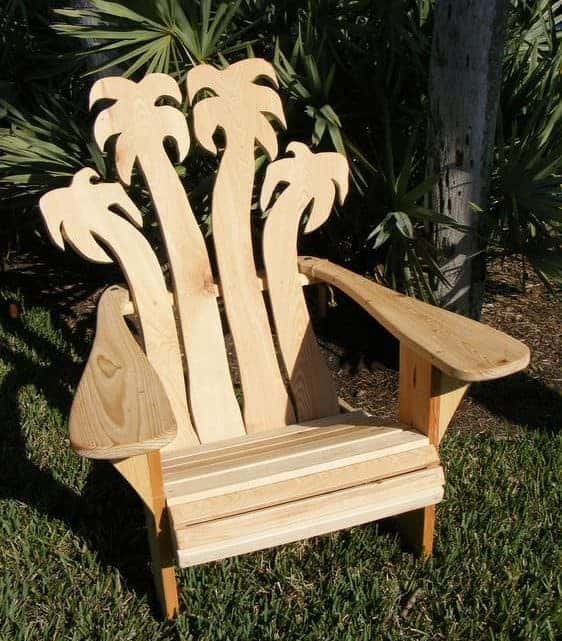 The Adirondack chair name came from the Adirondack Mountains region, located in upstate New York. The Park spans over six million acres (24,000 km²). However, nearly half of the park belongs to all the people of New York State. The Adirondack State Park and Forest Preserve exist as the largest of the "Historic landmark" parks in the United States. Initially, it was designated as a Forest Preserve in 1885, stating that the Preserve "shall be forever kept as wild forest lands." It became a formal State Park in 1892 by New York State due to water and timber resource concerns in the area. Today it is the most significant publicly protected area in the contiguous United States and is greater in size than Yellowstone, Everglades, Glacier, and Grand Canyon National Park combined! Half of the park is designated as privatized land that includes farms, timberlands, businesses and an active timber harvesting industry. It is the inclusion of human communities that make the park one of the great experiments in conversation in the world. In 1903, Mr. Thomas Lee was looking for comfortable outdoor furniture for his country cottage in Westport, NY, located in the Adirondack Mountains region. He designed the best lawn chair in the world after dissatisfaction with available garden furniture. His goal was the perfect chair to comfortably observe nature, read, eat, drink, and relax. He made several prototypes tested by 22 members of his family. Finally, he came up with the gentle recline, wide armrests, and the necessary style that we now know as the Adirondack chair. This chair was suitable for both indoor and outdoor use and provided wide armrests to hold books, glasses, cups, etc. He added a small ottoman to elevate the feet. Lee had a hunting buddy named Harry Bunnell, who was also a carpenter and looking for income in the off-season. Lee showed Bunnel his design and encouraged him to start making the chairs for local sale. He made the design out of hemlock or hickory and sold them for a good profit for the next 20 years. Bunnell filed the patent application on April 4th, 1904, and received the patent on July 18, 1905, under the name of "Westport Chair." However, he didn't disclose the information to Lee. The patent protected Bunnell's design for 25 years and prevented anyone else from making this unique chair. However his "Westport chair" was distributed only locally in Westport and did not have the expected success. The modern Adirondack Chair design springs from the original Westport design. There is no evidence that Bunnell ever shared any profits, or that Lee asked for any. In the 105 years since that time, the seat has gone through a lot of changes. The back is often raked, made using between three to seven slats of wood. This design change is mostly due to the difficulty finding knot-free wood. Additionally, a single slab of timber with irregularities is less comfortable than multiple smaller slats. Modern variations include using pine and other inexpensive woods. Paint is standard, and the most popular colors are forest green and brown. Some companies make them out of 100% recycled plastics and stainless steel for longevity and no maintenance! The ottoman is an attractive addition, made desirable by the gentleman farmers of the time. The footrest was favorite among the more prosperous families along the East Coast of the U.S. Rocking chair versions are also a comfortable, relaxing variation. Today, it is present in many North American Gardens and outdoor living spaces. You’ll also see them called Muskoka Chairs. The Chairs are manufactured around the world, from the United States to China. Artists use fir, cedar, teak, plastics fiberglass, metals, and even pallet wood. Artists stain, seal, upholstery, decoupage and paint the chairs. Some have designs cut or routered into them, painted onto them, styled like legendary film characters, skulls and more. They come in an astounding variety of variations! Some ideas closely mirror the original or veer off into unique interpretations. The original Adirondack Chair’s classic styling stands up to the test of time while inspiring many to create their interpretation. One search for “modern interpretation of Adirondack Chairs” will produce thousands of creative designs! Modern designs arise from one idea built well over 100 years ago. Thomas Lee never received the formal credit and profits he deserved. However, he made a desirable and comfortable impact on the concept of outdoor living! His idea has toured the world, garden to garden. Check out these Adirondack beach chairs with themes such as tropical, palm tree, flip-flop, Margaritaville. There are many more designs for the perfect summer chair! 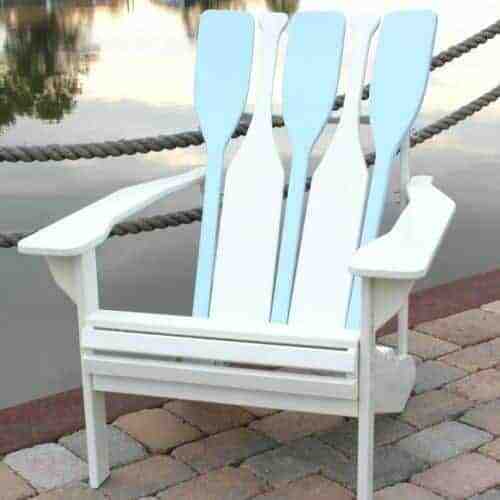 Carve the backrest into paddle shapes, or even use real wooden oars! 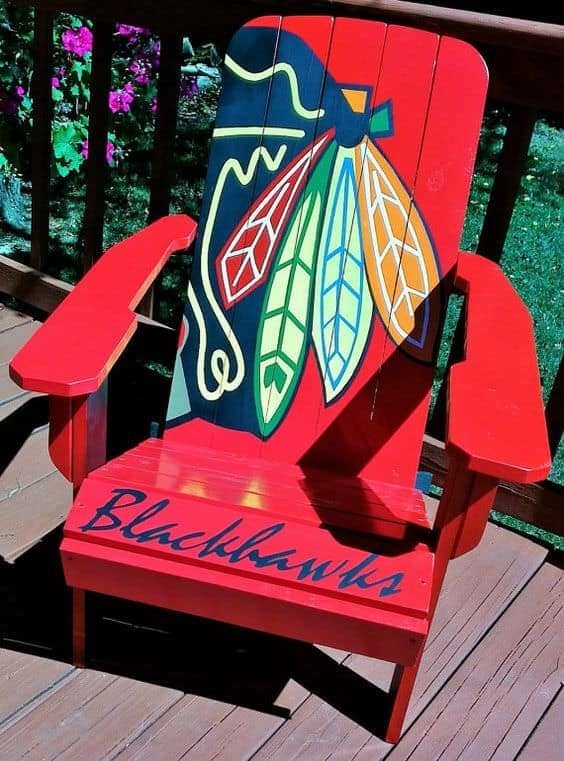 This chair would be perfect for that lakeside cabin! Be unique and express your creativity. Use a jigsaw or band saw to cut out patterns or designs into your chair. 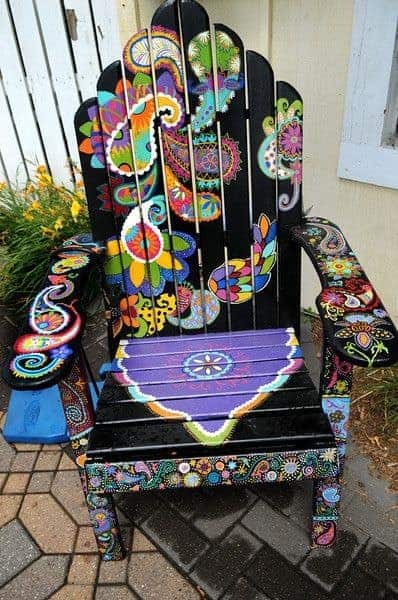 This Playful Paisley Adirondack Chair is better than any adult coloring book! Parents, pull out those pencils and create fun designs and then sit back with a cold beverage while the kids paint the chair for you! A project titled "Playful Paisley" by Ashley Hadfield which sits in front of Eichten's Market and Bistro in Center City. This Adirondack is part of the Highway 8 Chairs project in Chicago County. The county commissioned 37 Adirondack-style chairs, each painted by an area artist on Friday, July 26, 2013. The art pieces stretched along the highway between Chicago City and Taylors Falls. A local non-profit group launched the project to attract visitors back to businesses after road work caused financial havoc. 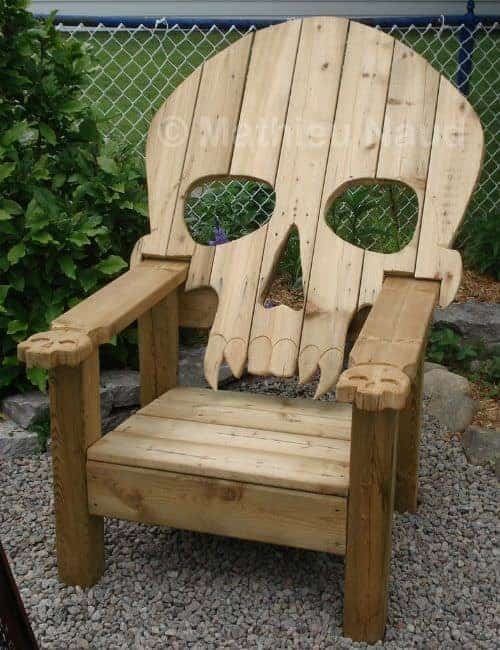 Give visitors no doubt that this Skull Chair is your throne! Perfect for that person that celebrates Halloween twelve months per year. This eclectic Adirondack Chair is a whimsical interpretation of the classic, and it would be an eye-catching poolside chair! The crafter made their Adirondack with pallet wood. It is certainly the funkiest chair I've ever seen. However, it does look comfortable. Go, team! 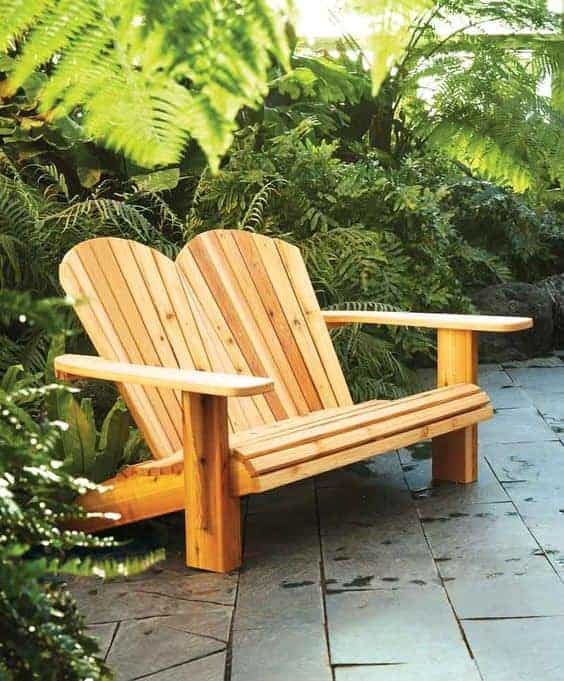 The classic style of the Adirondack has a large canvas for your individuality. Show your support for your favorite team, band, political representative, or anything else you want to let everyone know you, love! Everything is better when shared with a friend, including this Double Adirondack Loveseat. 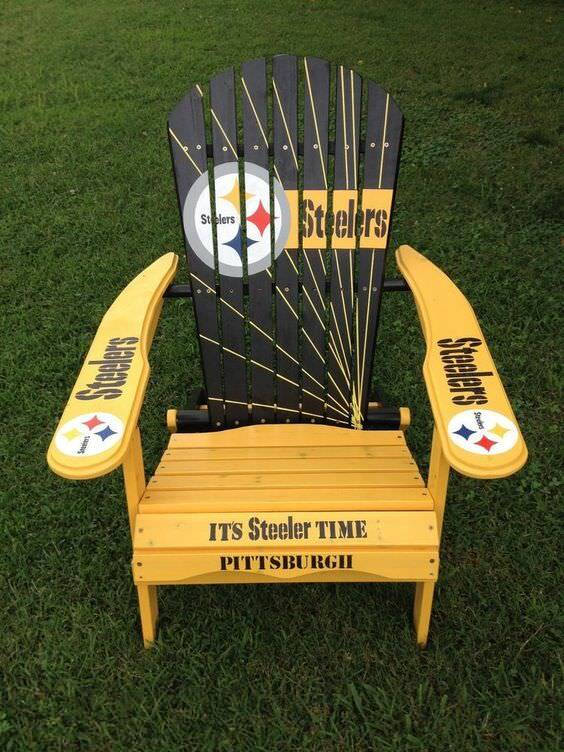 Enjoy the game in your man cave with this Pittsburgh Steelers Adirondack Chair. 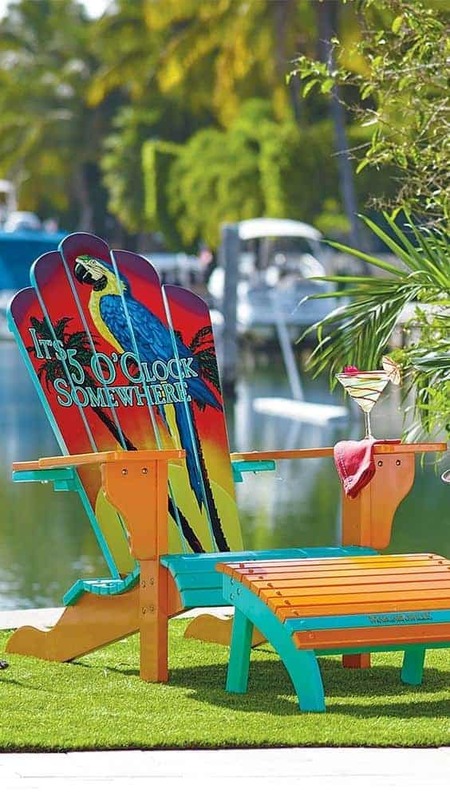 This Margaritaville Adirondack features everything you love about classic Adirondack pallet furniture but with a tropical twist. 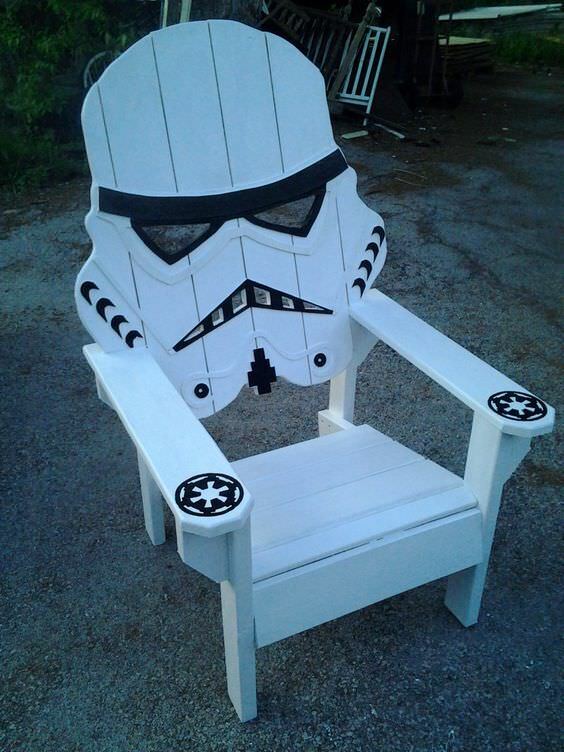 If you've got a favorite movie, character, or book, turn it into a theme for your chair. 1001Pallets.com can help you if you are searching for more DIY pallet projects. I want 5 and 9. Will I ever get to use our deck chairs again? BRRRRR!! !